This book takes you into the world of drawing fast and easily. Loomis makes pencil sketching enjoyable & immediately productive. It is a Loomis classic and a very good treatise on general beginner drawing. It ranges from numerous character-type head drawings to minor figure construction, and some general perspective. 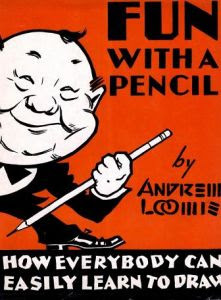 For those fans of Andrew Loomis, this book is worth having, if for no other reason, as a collectible of the legacy of a great artist and illustrator. If you like this book, feel free to download from this link.